It overflows the Pecos River which as it has never seen so much filth! First film of the genre dubbed the "Bean Western", the work of E. B. Clucher who innovated the genre which become an absolute cornerstone of world cinema and made the duo legendary. Thanks to this film, seen around the world, the duo quickly became popular and much loved by the public of all nationalities, from France to Hungary, from Australia to Argentina. 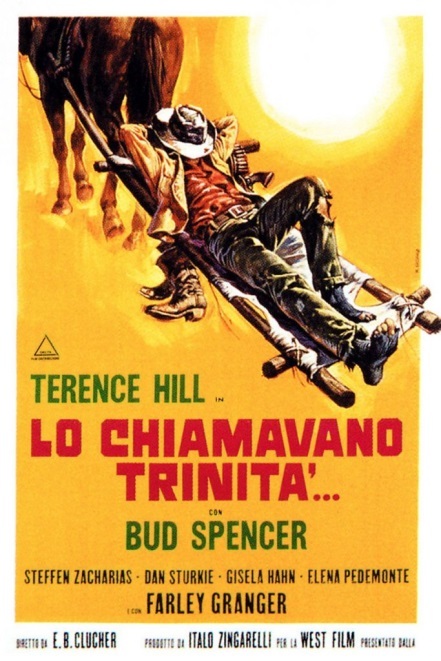 Trinity (Terence Hill), a lazy but fast gunman, reaches a small town in West where his brother Bambino (Bud Spencer), has become the sheriff. Bambino is not actually a real sheriff but a horse thief waiting for the rest of his gang to show up. In the countryside a rich horse owner, Major Harriman, is struggling with a community of Mormons: he wants to evict them from the valley to graze his herd. Trinity, in love with two girls of the community, and Bambino, gruff but allergic to bullies, help the peaceful Mormons to defend themselves. Curiosity: the musical score is by Franco Micalizzi prolific author of soundtracks, here is his first job as a film composer. The lyrics of the song that opens and closes the film is the British singer-songwriter Lally Stott (already known for the hit Chirpy Chirpy Cheep Cheep) while the singer who is doing it is Hannibal (Hannibal Giannarelli), an Italian-Australian with an imposing physical presence and a powerful voice that reminds on of Tom Jones. The whistle instead was done by Alessandro Alessandroni who was called the "whistler", so nicknamed because of the powerful sound which could e minate from his whistle. The "Whistler", had become known from the soundtrack for “A Fistful of Dollars” by Ennio Morricone, who used him after having long sought someone who could whistle.